Join us in Philadelphia on February 22 for Talking Tea’s second live event! We’ll be joined by Nate Cochran of Spirit Tea to delve into tea processes and cultivars from a tasting perspective. If you’ve been drinking tea for a while, or even if you’re a tea newbie but you’re familiar with coffee, wine or beer, you’ve probably heard something about cultivars or varietals. You may be aware of the crucial roles cultivar and process play in the transformation of tea leaves, coffee beans, grapes or hops. Tea has an amazing array of cultivars and processes. In this two-hour tasting workshop we’ll be exploring two classic cultivars, the well-known Tie Guan Yin and Taiwan’s Qing Xin. Both are traditionally used for oolong teas but today are being transformed into black teas as well. As we taste oolongs and black teas made with each cultivar, we’ll look at how different processes applied to the same cultivar can create astounding differences in taste and aroma. Admission includes tastings of 2 teas made with the Tie Guan Yin cultivar, 2 teas made with the Qing Xin cultivar, plus 1 version as a cold brew. Pilgrim Roasters, a roastery cafe in Philly’s Manayunk neighborhood, has graciously opened its doors to us for this event. In addition to its specialized sourcing and roasting of small batch coffees, Pilgrim is dedicated to serving excellent tea and fostering tea education and awareness. 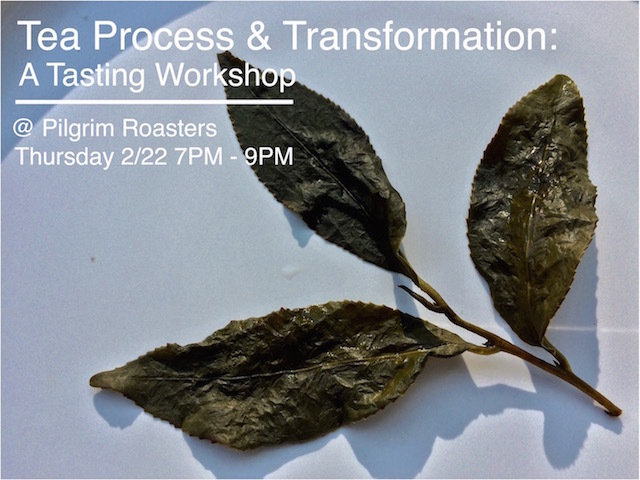 Like our last event, this is a live event only – we won’t be recording it – so join us in Philadelphia on February 22 for Tea Process and Transformation – A Tasting Workshop. 7 PM to 9 PM, Thursday, February 22, 2018. Pilgrim Roasters, 4120 Main Street, Philadelphia PA 19127. Map it. DRESS CODE: casual, no perfume.